Of all the hobbies I have (and I have a lot of them), one is surely the most authentic. Of course, we are talking about constructing and flying an RC plane. RC planes come in various shapes and sizes, and it’s sometimes very hard to pick an RC plane you need. But, we are here to make your life easier and maybe give you a great idea regarding your RC plane shopping. Today, we are going to talk about Avistar Elite 46 RTF RC Plane created by Great Planes. So, what exactly is this plane? At first glance, it’s a plane and it’s a very beautiful one. The best way to describe the look of this plane would be stylish, sleek and old-school. Stylish because of amazing wood sections, sleek because it looks very professional and old-school because it reminds of the airplanes used in WW1 and WW2. Have you played Battlefield 1? If you did, you know what I’m talking about. The only difference is the size and the lack of machine gun, which I can’t help you with. So, what makes a particular RC plane interesting? 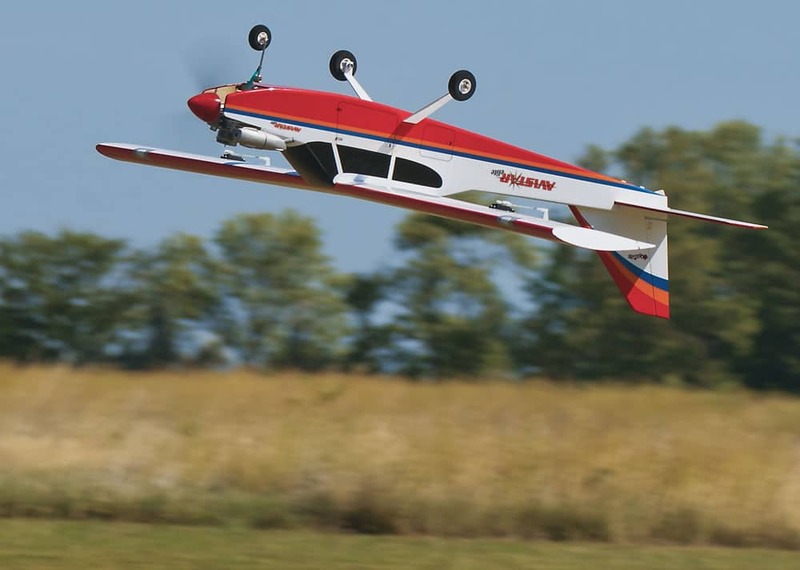 Is it the fact that it’s an RC plane or simply the way it works? First things first. When you get this plane, you’ll notice that it’s very easy to assemble and you can do it in less than ten steps. When assembled, your plane will be white-colored in the upper part and red-colored in the lower part. To make things not-that-bland, Great Planes included some white and orange strips to break the monotony. Another interesting thing about this plane is its built quality and the material used. Most RC planes come with that infamous Z-Foam, but not Avistar Elite 46 RTF RC plane. Instead, it’s made completely out of balsa and ply with the addition of aluminum joiner tube. You’ll immediately feel the sturdiness of this plane, but also the heaviness, which isn’t that great (more on that later). What I’m very happy about is a much-needed transmitter which comes with the plane. I simply can’t express how happy I am! However, Avistar Elite 46 RTF RC plane is Gas Powered, meaning that you’ll need to buy some gasoline for your flying friend. With a powerful O.S. .46AX II engine, a beautifully-crafted propeller located at the front will spin like crazy, allowing this plane to reach much greater heights. 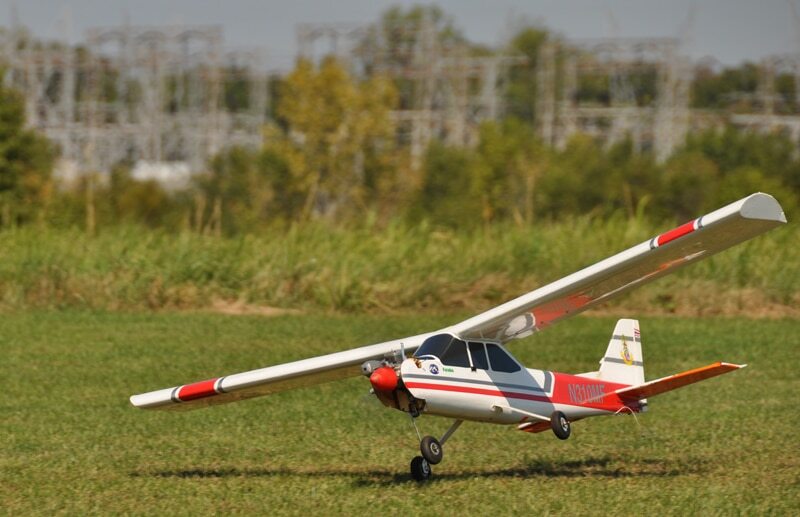 Since this is a Gas Powered RC plane, you’ll be happy to enjoy greater flight time and you have landing gear to properly land your plane. Just make sure not to land it in the water- it’s not much of a swimmer, although it’s definitely better than me. An awesome RC plane must have its set of awesome features, isn’t that right? Well, it surely wouldn’t be awesome without great specs. As we mentioned earlier, this plane is VERY strong and durable due to its build quality. But, a strong material is always a heavy and robust material, which is exactly the case we got here. We are talking about a 16.1 pounds RC plane and that’s slightly heavier than a grown-up Australian Terrier. Thankfully, the fuel tank is capable of holding 240 cc of fuel which is around 8 0z or a little more than 240 grams. It’s like you pour a glass of gasoline into your plane and that’s a decent amount of gas if you ask me. Have I mentioned the engine? Let’s do it again. The visible O.S. .46AX II AB engine is here to give this plane what it needs to fly. I intentionally mentioned that it’s visible, so it’s easy to repair in case it gets broken. When it comes to the visible stuff, it’s important to mention a great Tactic TTX600 6-channel 2.4 GHz radio. This bad boy is included and gives you more than enough resources to control this plane, including five standard servos and a trainer system. Finally, the landing gear is made out of prebent aluminum with two 2.5″ foam wheels and 2″ nose wheel. This is definitely a pleasant surprise and a welcome addition. – The durability of this plane is insane! That’s right, boys and girls. Forget about Z-Foam which tends to break (and repair) easily. Instead, balsa and ply make things so much smoother and sturdier. Users will definitely benefit from a much stronger build quality. – Avistar Elite 46 RTF RC plane is RTF. RTF stands for Ready to Fly and you all know what that means! You can grab your box, unpack it, assemble the plane and start flying. Furthermore, the assembly is glue-free, with pre-hinged control surfaces. Simple as that. – Powerful O.S. .46AX II glow engine is awesome for much greater flight times. Its raw power is simply humongous and it does a great job of giving this plane an additional boost. Avistar Elite also has a motor mount for mounting an electric motor, so you can use that one if you prefer it over a Gas Powered engine. – Radio is included, oh yeah! A great 6-channel Tactic TTX600 2.4 GHz radio is here to give you an absolute control of your aircraft. You can finally fly like a pro! – Landing gear is awesome. To make your landings look professional, Great Planes added landing gear underneath the plane, and that’s admirable. Prebent aluminum with foam wheels will give you an edge when it comes to smooth landing. – This plane is robust and HEAVY. As we mentioned earlier, Avistar Elite 46 RTF is a true heavyweight contender. With a total weight of the plane around 16.1 pounds and an eagle-like wingspan of 62.5 inches, this plane is all but small and cute. You’ll need a bigger vehicle than a car for transportation. – The price of the plane is really high. Coming at around $349.98, the plane is a lot more expensive than its similar counterparts. I do justify the high price at some point, but it’s not exactly a high-end RC plane, so yeah… the price isn’t my cup of tea, although we have some pretty good specs. This plane came from our guide for the top-rated RC planes, found here: topratedanything.com/reviews-of-todays-best-radio-controlled-airplanes/. In the end, it all boils down to the price-to-performance ratio. Is this plane really worth a buy? Avistar Elite 46 RTF RC Plane is a great mid-range plane for having lots of fun flying and maintaining it. Great Planes did an amazing job of making this plane very accessible, albeit a little less affordable for those with a limited budget. If you like big and robust planes, this will surely satisfy your needs. However, if it’s the agility and lightweight you seek, I’m afraid that this giant will not suit your needs. I do like additions like landing gear, propeller, and a radio. In fact, they made my day the moment I opened the package. I’m gonna enjoy my flying with this plane and I recommend you do the same. Flying is fun, so let us enjoy whatever the cost.